More than 300 regional and global C-suite executives attended the third edition of the annual Middle East Summit hosted recently by Standard Chartered in Dubai, UAE. Held under the theme of “Fighting the Current”, the flagship event was held exclusively for Standard Chartered clients and, this year, witnessed the attendance of Distinguished Fellow – Dr Janet L Yellen, among other high-profile individuals. 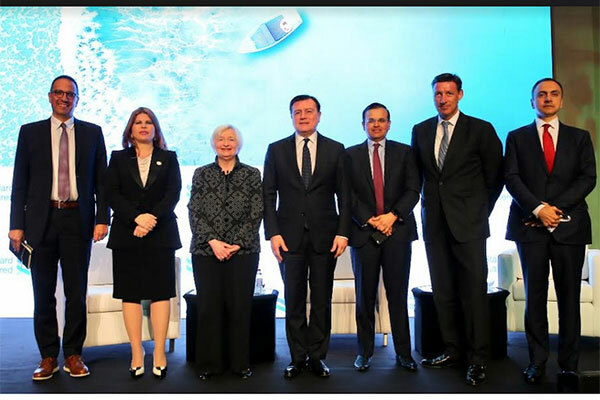 Named the second most powerful woman in the world and as one of the most influential economists and policymakers worldwide by Forbes, Dr Yellen participated in a stimulating panel discussion along with the bank’s chairman José Viñals. The thought-provoking session was moderated by Riad Hamade, Executive Editor at Bloomberg News for the Middle East and Africa. During the panel, Dr Yellen shared her perspective on the global economic outlook, the impact of trade tensions on the US economy as well as a GCC economic outlook. In addition, she explained the Federal Reserve’s decision-making process and assessing the global economy’s impact on its decisions. Sessions that took place throughout the event included key insights and analysis on the local, regional and global economic outlook by David Mann, chief economist at Standard Chartered Bank, in addition to 2019 trending topics such as new US tariffs, the US Trade War, OPEC policy, oil prices, strength of the dollar and the impact these topics will have on the region. The panel discussion also sparked discussion on how Middle Eastern economies are performing, particularly in the GCC, additionally, touching on topics including inflationary pressures, wage push inflationary and second-round effects. “As one of the most influential economists and policymakers worldwide, it was a pleasure to host Dr. Yellen to present her insights on local and international emerging trends and topics. We were also honoured to have our Chairman, José Viñales, taking part in this year’s edition.